472 pages | 145 B/W Illus. Astrobiology is a multidisciplinary pursuit that in various guises encompasses astronomy, chemistry, planetary and Earth sciences, and biology. It relies on mathematical, statistical, and computer modeling for theory, and space science, engineering, and computing to implement observational and experimental work. Consequently, when studying astrobiology, a broad scientific canvas is needed. For example, it is now clear that the Earth operates as a system; it is no longer appropriate to think in terms of geology, oceans, atmosphere, and life as being separate. 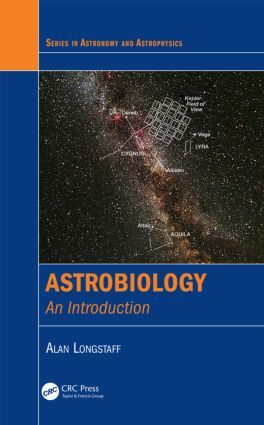 Astrobiology: An Introduction provides a full introduction to astrobiology suitable for university students at all levels. Hot Spot Volcanism: Evidence for Mantle Convection? Did the Decay of 26Al Make Life on Earth Possible? How Did the Terrestrial Planets Acquire Water? Did Terrestrial Planets Accrete Dry? Did Terrestrial Planets Accrete Wet? When Did the First Oceans Form? When Did Plate Tectonics Start on Earth? What Was the Nature of Early Plate Tectonics? How Useful Are These Criteria for Detecting Life? Are There Universal Chemical Requirements for All Life? When Did Earth Become Cool Enough for Life? Where Did Prebiotic Synthesis Happen? Did Metabolism Emerge Before Replication? What Was the Last Universal Common Ancestor? When Did Oxygenic Photosynthesis Start? Was Mars Episodically Warm and Wet? Does ALH84001 Harbor Evidence of Life? How Thick Is the Europan Crust? What Is the Astrobiological Potential of Europa? Astrometry Detects Binary Systems by Stellar "Wobble"
Did Terrestrial Planets Form 11 Billion Years Ago? Are There Habitable Planets in Clusters? Is an Early Origin a Guide to the Probability of Life? What Are the Hard Steps? Is Life Seeded from Space? Is the Drake Equation More than a Guess? How Far Away Would Passive Radiation Reveal Our Presence? Alan Longstaff originally trained as a biochemist and, after a senior lectureship in the Biosciences Department at the University of Hertfordshire, he became a university student once again to study astronomy and planetary science. He now divides his time between teaching and writing. Since 2003, he has worked part-time as an astronomy tutor and planetarium presenter for The Royal Observatory, Greenwich, and held part-time teaching posts at Queen Mary University of London, Waldegrave Science School for Girls, and the Open University. He has lectured to astronomical and geological societies, co/authored several textbooks, and is a regular contributor to Astronomy Now.